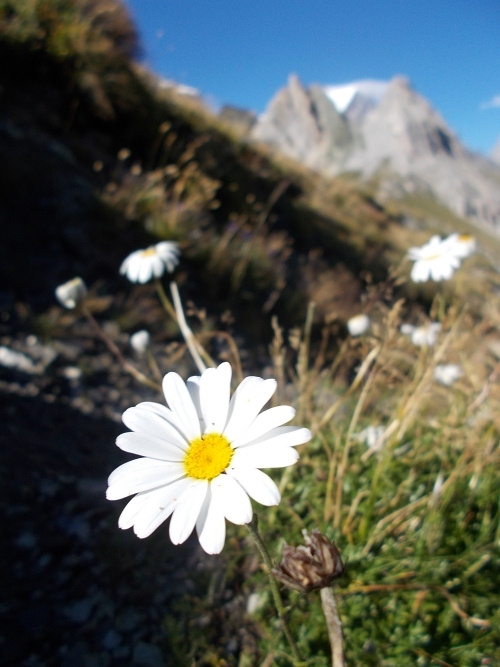 Another Long Walk: Day 3: Buongiorno! 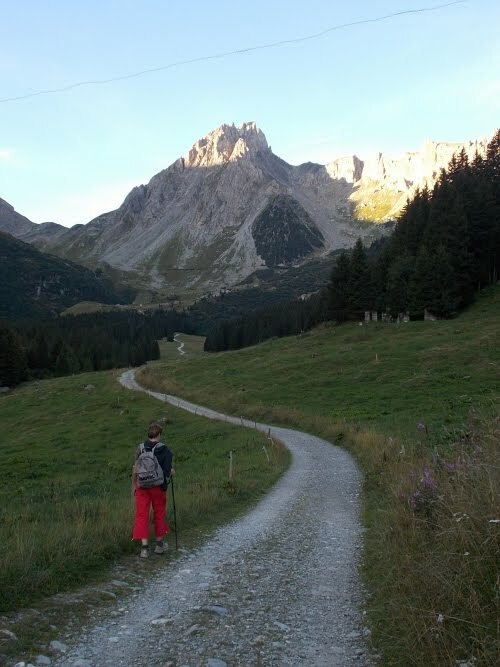 August 28: I woke up and hit the trail by 7:30. 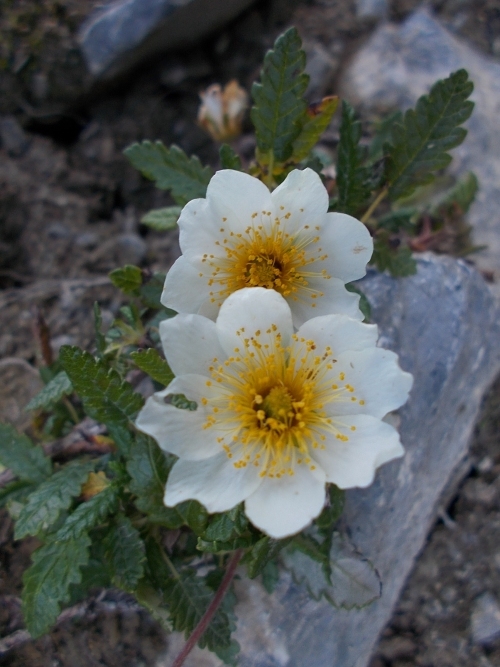 I lingered in camp longer than I would have preferred, waiting for the sun to rise. 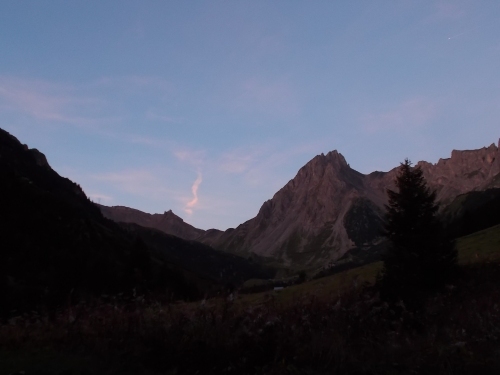 By late August, daylight has become noticeably shorter, and I found myself waking up--then not being able to hike because it's too dark for photos. 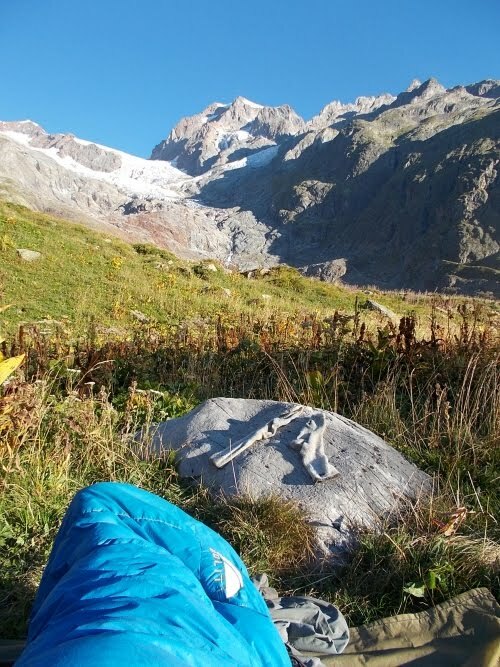 I was also located on the west side of Mont Blanc making it that much more difficult for the sun to rise above the horizon as my campsite loomed in the shadow it cast. I hoped I might gain a bit of early morning daylight when I started camping on the east side of the mountain. Dawn from camp. I had to linger in camp a bit later than I preferred waiting for it to get light enough to take photos. Once the sky started brightening, however, I was finally able to get a move on, and the views--for basically the entire 21 kilometers I'd be walking today--were absolutely drop-dead amazing! The trail climbed above tree line and pretty much stayed there for the entire day. The skies were clear and sunny, the temperatures warm and pleasant, the breeze crisp and dry, the animals indifferent and noisy. I stopped for my first snack break of the day at the first pass I reached, Col du Bonhomme--with stunning views in all directions. I didn't really feel like I needed a rest, but I was in absolutely no rush at all. 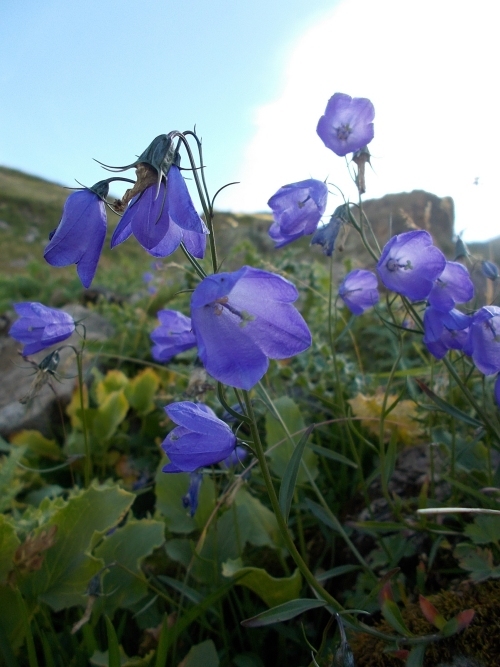 I had about 11 days to hike about 110 miles--a piddling pace of a mere 10 miles per day. Over rugged terrain in the White Mountains, that could be an all-day endeavor. So far on this hike, it's been a cake-walk. There are many ups and downs, but they've been well-graded and often follow little-used dirt roads. I could slow down and enjoy every amazing viewpoint along the way. 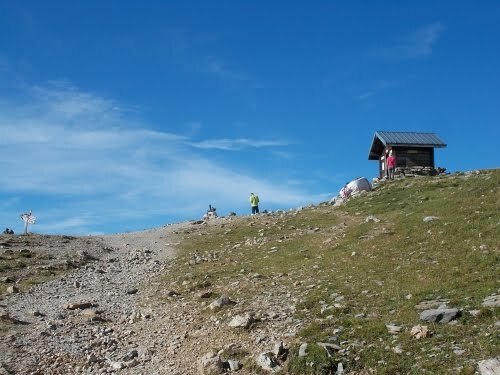 When I arrived at Col du Bonhomme, there was one couple already at the top who were leaving just as I arrived. I lingered at the top for about a half hour and watched a progression of other hikers arrive soon after, eventually filling the summit with about a dozen people. Feeling a little claustrophobic and anti-social, I picked up my pack and moved on. 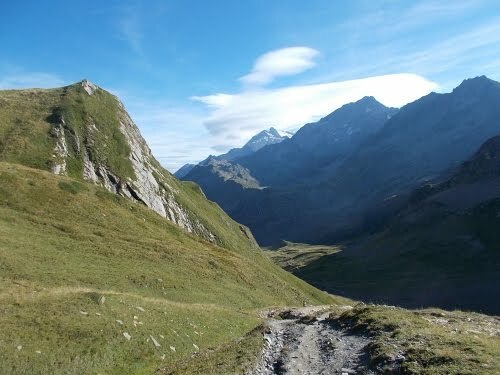 The trail soon passed to the next pass, Col de la Croix with more jaw-dropping views. This point marked a decision point as well. 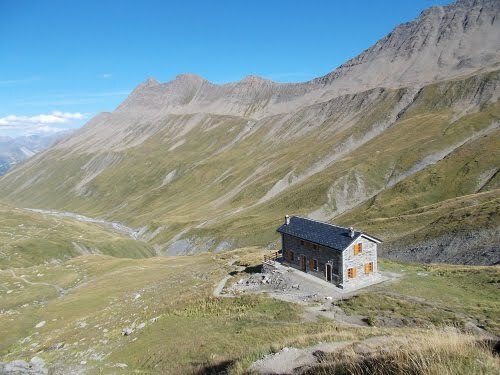 I could view southward and head into the small town of Les Chapieux, or I could veer eastward and skip the town, rising to 2665 meters (8743 ft) above sea level at Col des Fours--tied as the highest point along the trail. I decided to skip the town. I had plenty of supplies and this was my element! Nature was where I wanted to be! Now it's getting light enough to take photos! Not great photos, but photos none-the-less. 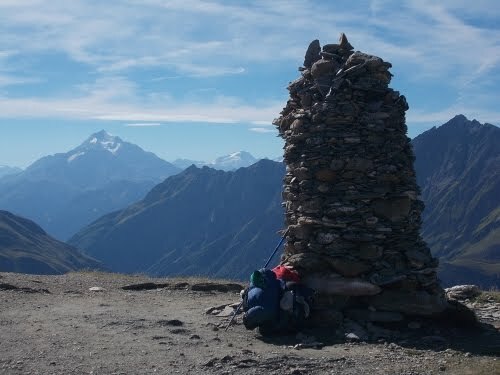 The high point of the trail at Col des Fours actually didn't have the sweeping views I was expecting because it was hemmed in on both sides by even taller mountains, so I followed the trail down the other side a short ways where the views opened up before stopping for another break. I tried thinking of words to describe the breathtaking scenery, but they all fell flat or sounded like clichés. Breath-taking! Jaw-dropping! None of them could really do it justice, though. I snapped photos like a madman, trying to capture the wide-sweeping views and knowing I'd fail. The photos would be stunning--no doubt about that--but still miss the grandeur of the region. The only thing really marring the views was an enormous set of powerlines, tall towers reaching high in the sky with the cables arching between them. Whoever approved those eyesores should be ashamed of themselves. 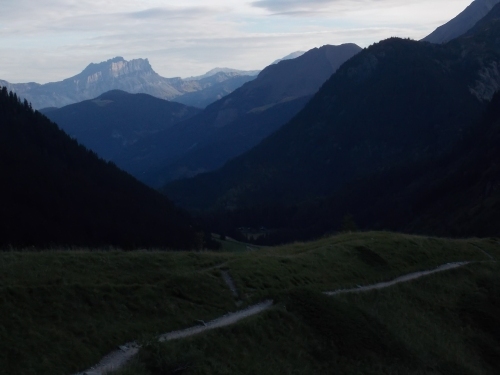 The trail then dropped down to Ville des Glaciers, a small little town where chickens roamed free. I met a couple there from the Netherlands who took a look at my pack and explained everything I was doing wrong. The pack was too low, they told me, and too big and heavy. 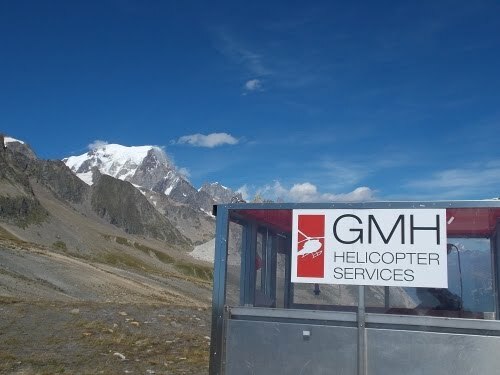 I'd never made it around on the Tour Mont Blanc unless I fixed those problems. My pack was, admittedly, heavier than it needed to be. 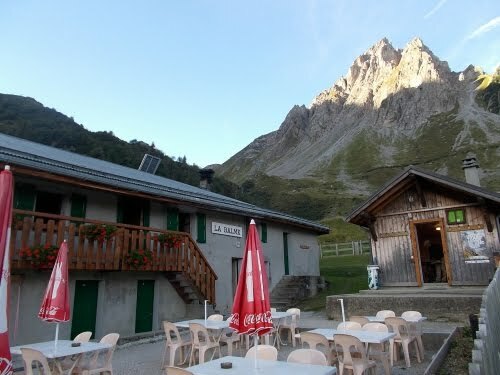 I carried a couple of extra days of food that I didn't have to carry, but choosing to do so so I wouldn't have to make the trip into Les Chapieux earlier in the day to resupply. I also carried my laptop--a horrible 3-pound monstrosity--mostly because I didn't know what else to do with it. I wasn't exactly sure how to ship the laptop to myself further up the trail like I did in the United States. 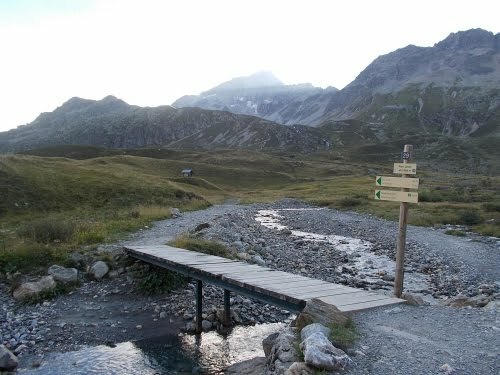 I carried a heavy guidebook for the GR 20 even though I wasn't even on the GR 20 because I didn't know how else to get it to myself between here and there. But--here's the thing: My pack was still lighter than it was on the Appalachian Trail. Because resupply points were much further apart on the AT, I had to carry a heck of a lot more food and supplies than I did here. I was walking half the distances as I did on the AT, with a lighter pack, on much easier terrain. I was pretty sure I could make the distance despite the couple's dire predictions for me. 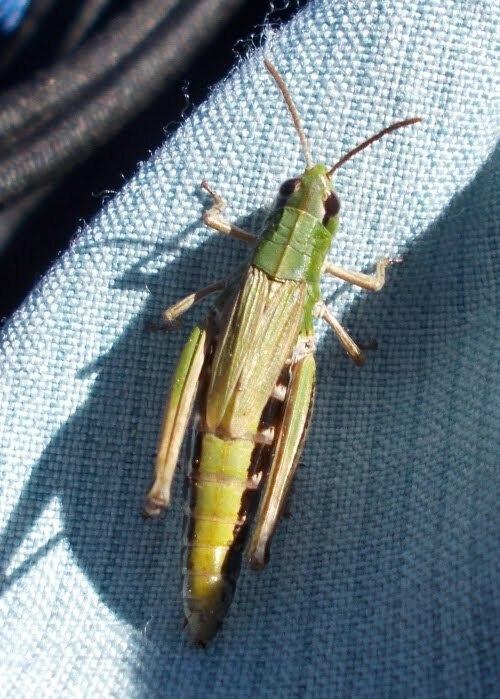 I wanted to tell them to bug off and mind their own business because obviously, they were idiots. 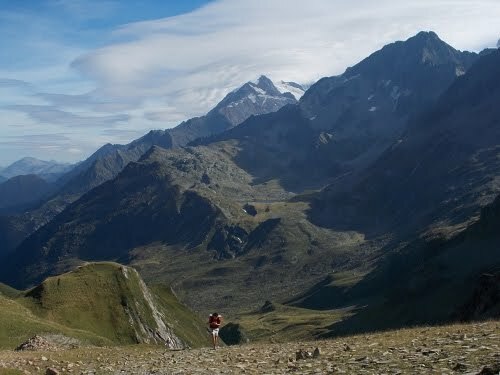 Instead, I told them that I had just finished walking over 3,000 kilometers less then two weeks earlier on terrain much more challenging than this and I succeeded just fine, thank you very much. I think I'll be okay. The climb was a relentless one, up and up, but well-graded and--I thought--not particularly challenging, although some out-of-shape hikers struggled to the summit. 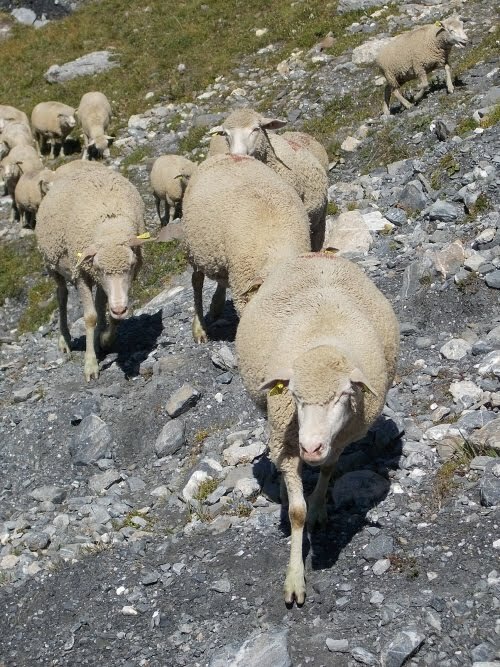 About halfway up, I saw an incredibly long line of sheep heading up a parallel ridge. The sight was mesmerizing. I'd never seen so many people lined up like that. They must have stretched at least a mile from one end to the other. I couldn't even be sure how long the line stretched because at one end, an intervening hill got in the way of my view. It appeared that the line of sheep might cross the trail higher up, but I couldn't be certain until I got higher up. I took photos and videos. The line of sheep looked like a line of ants marching to a food source. I could hear their bells clanking faintly in the distance. I hiked further up the trail, where the long line of them did, in fact, cross the trail and a dozen or so hikers had stopped to admire the spectacle. Nobody was crossing the line of sheep, though, and I started to wonder how aggressive they might be. Was there some reason to be scared of them? They did outnumber us by a thousand to one, but all of the sheep I'd never seen always seemed terrified of their own shadows. I couldn't imagine trying to walk through them all would be dangerous, so I cautiously approached the line to see what would happen. And they seemed surprisingly okay with my being there. They didn't seem afraid of me like most sheep do, but seemed content to go around me. 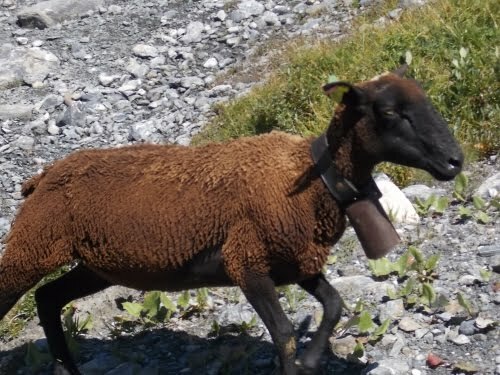 As soon as got through the sheep, several of the other hikers soon followed me. I think they really were genuinely concerned about how safe it was to approach those sheep but seeing me cross safely gave them the courage to make a go of it themselves. We'd probably have to wait for an hour if we wanted to wait for the end of the conga line of sheep to pass. Looking back from the direction I had come. I had camped (I think) at that small meadow at the bottom of the valley. 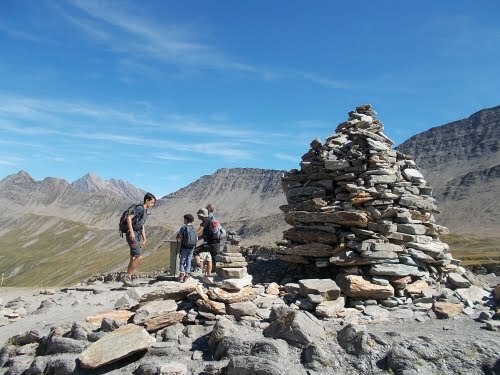 I continued up to Col de la Seigne--the French/Italian border marked with a large cairn and dozens of hikers milling around. And a large, transparent box loaded with supplies for the ultra run. The views, once again, were jaw-dropping. What an entrance to Italy! Arrival at the col is an eye-opener. 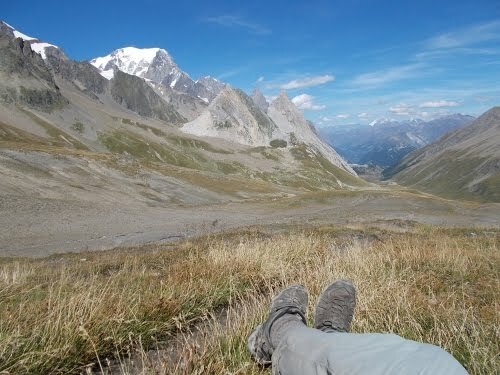 Standing on the borders of France and Italy views in all directions are magnificent. 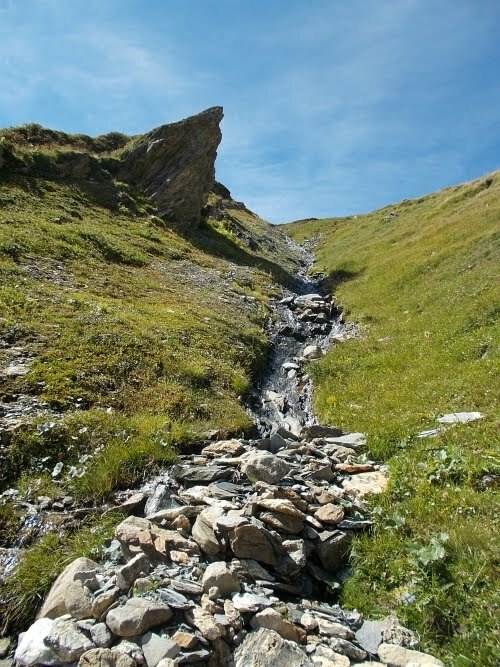 Directly ahead the hillside falls away into a long, deep trench that forms a moat to the southern bastions of the Mont Blanc range.... Along the ride-hand wall of this 'moat' a rumpled green hillside carries the route of the TMB, while the left-hand wall boasts a succession of astonishingly rugged peaks and spiky ridges interrupted by cascades of ice and grey moraines. Dominant in all this is the graceful iced dome of Mont Blanc itself, with the spectacular Aiguille Noire de Peuterey running a close second. The scene is exquisite and dominated by verticals. I took a seat in the grass, overlooking the Italian side of the border and just admired the view. I couldn't imagine anywhere else in the world I'd rather be than right here at this moment. I stayed here for about an hour. I would have liked to have stayed longer, but it was somewhat windy at the top and the crisp breeze eventually turned intolerable. As I left, the large, transparent box with supplies for the ultra run being unloaded and tents set up by a team of people. I had learned yesterday that the ultra run was no yet complete and knew I'd have to cross paths with them again, but the runners must be imminent if they were setting up this aid station now. Perhaps they'd be coming through tonight. I made a note to myself to camp well away from the trail where the runners would be going through so I wouldn't wake up with thousands of people running by my campsite during the night. It would disturb my sleep too much! 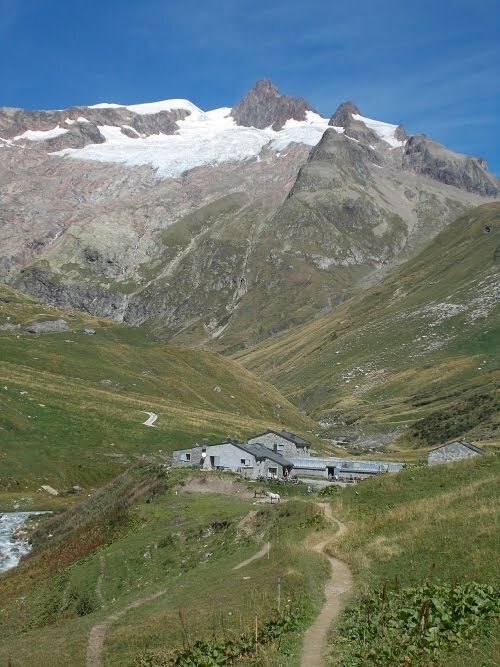 A short way down from the border, the trail passes a form customs house, the La Casermetta, which is now used as a museum and mountain information center. It was closing up when I arrived, but they let me look through it quickly anyhow. One of the signs on the outside explained the geology of the area, delving into plate tectonics and that we were currently situated on the border of the Europe and African plates. I had no idea I was so close to Africa! I took another look down the valley, this time with an eye towards geology, and it was plain as day. 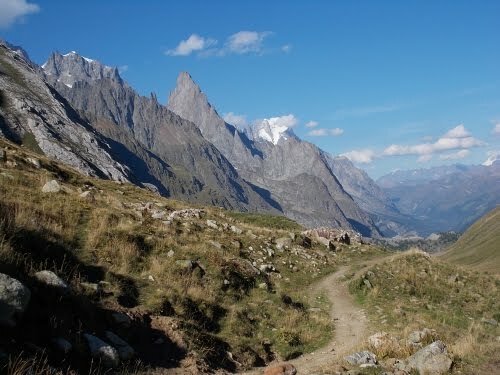 On the left side of the valley were tall, granite mountains--dramatic, sheer and "dominated by verticals." 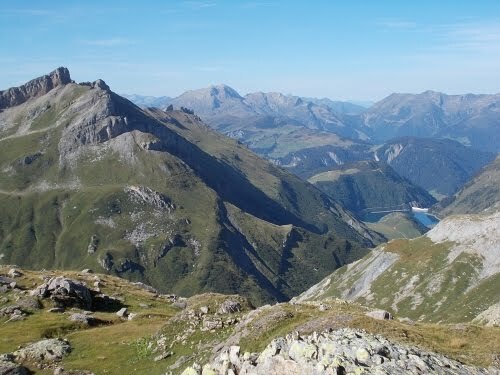 On the right side of the valley were smaller mountains (not small mountains, just smaller mountains) formed of sedimentary rock. They were shorter only because sedimentary rock is softer and erodes faster. 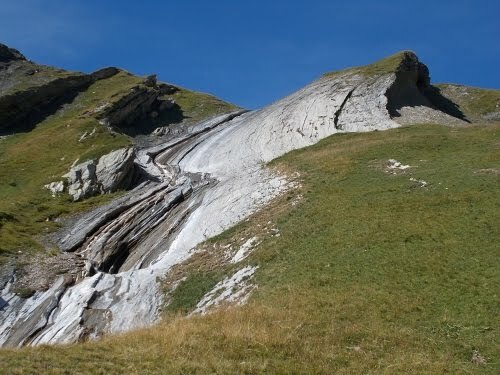 The snow, ice and glaciers were only located on the European plate--the erosion had lowered the mountains on the African plate below the elevation where glaciers would have formed. Both sides had stunning views, and at first I was a little disappointed that the trail followed along the sedimentary side of the valley--the side that, in my opinion, looked a bit less impressive than the sheer granite with its abundance of snow and glaciers, but the reason was readily obvious: How the heck could one build a trail through all that granite? With a little more thought, I realized that the views were actually better on the African side as well. It's like in Seattle. Everyone always wants to go up the Space Needle--which does have admittedly great views. But the best views in Seattle include the Space Needle. You can't really see the Space Needle when you're at the top of it--you're better off being at the top of the building next to it. Those are the best views in town. Almost immediately past the custom house, a sign split the ultra runners off from the main TMB. Yes!!!! I could camp right alongside the trail now and not have to worry about the runners running by my campsite! 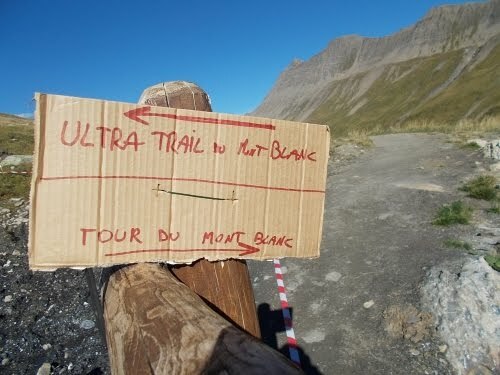 I had no idea why the ultra runners were being directed off the main trail here, but I was glad for it. Ideally, they'd all pass by during the night and I wouldn't have to deal with any of them during the day. I continued on down the trail, which slowly descended to a long valley where the trail leveled out. I camped next to a dirt road by a waterfall, pleased to have the area to myself. 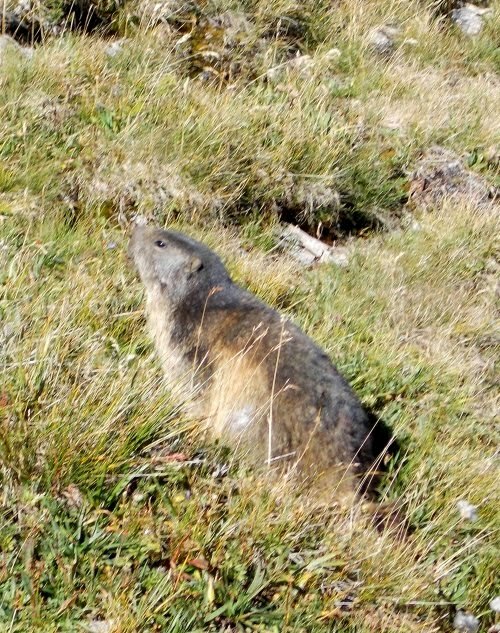 Within 15 minutes, however, two other hikers arrived and set up their own camp. They crossed the small creek to set up camp, however, so I never wound up talking with them. Once the sun set, the temperatures dropped and I cuddled up in my sleeping bad reading my Kindle for the rest of the night. Life was good! That doesn't sound good! 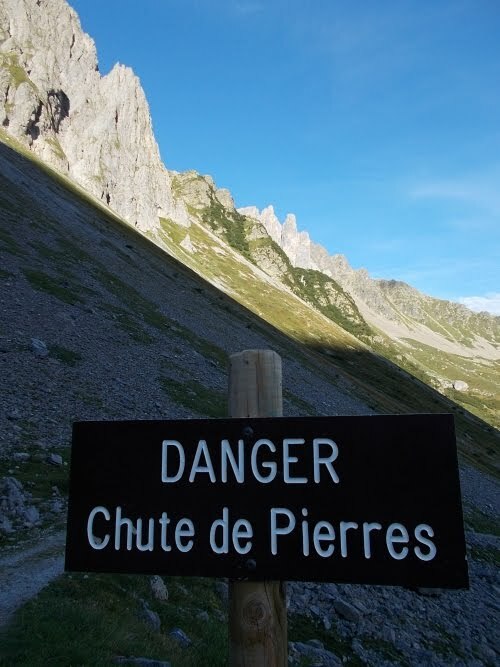 I may not know French, but even I could figure out it was warning about danger from rock slides! This huge pile of stones (the signs labels it "Tumulus Plan des Dames"), is said to be the spot where an English woman perished in a storm. 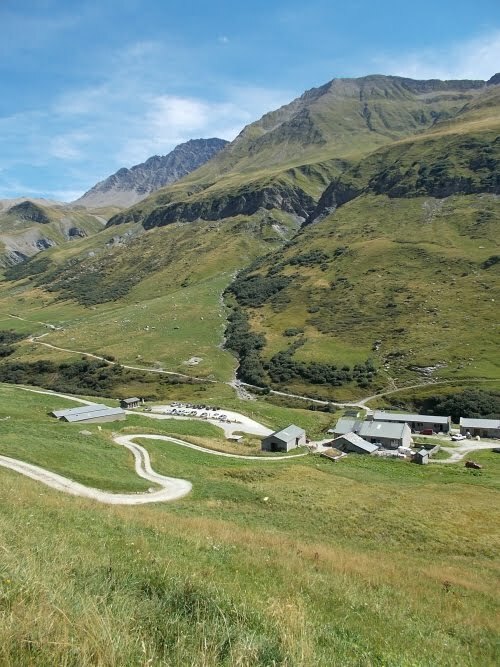 View looking back from where I came from Col du Bonhomme. 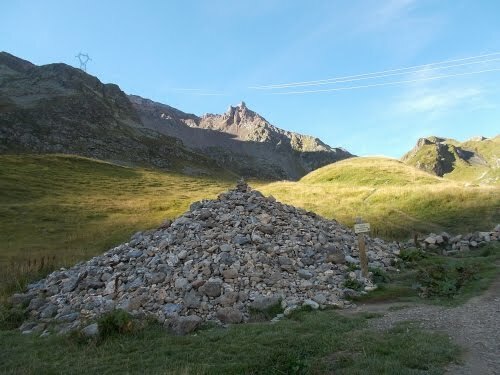 Giant cairn at Col de la Croix du Bonhumme. 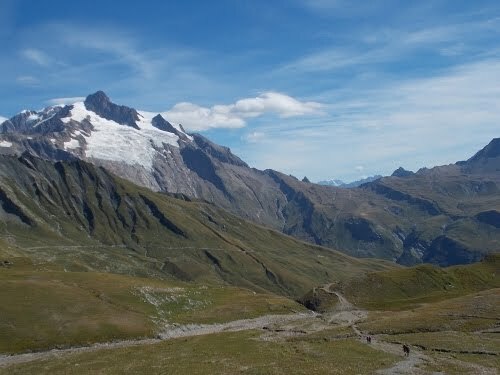 View from near Col des Fours--which is tied as the high point of the TMB. Some farm buildings that go by the grand name of La Ville des Glaciers. 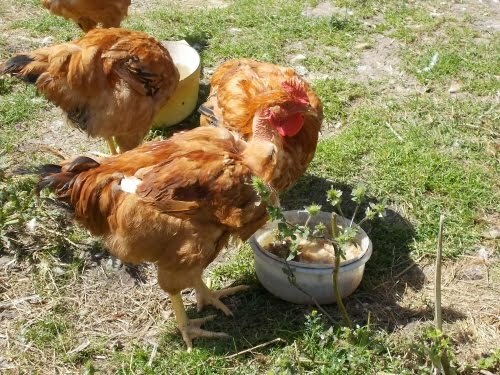 Free-roaming chickens and roosters in the La Ville des Glaciers. The hillsides might be steep, but the trail is very well graded and not particularly arduous! Holy crap! That's a lot of sheep! But see the video if you want an even better sense of how long this line of sheep are! The line of sheep, where it crosses the trail. They're after me!!!! 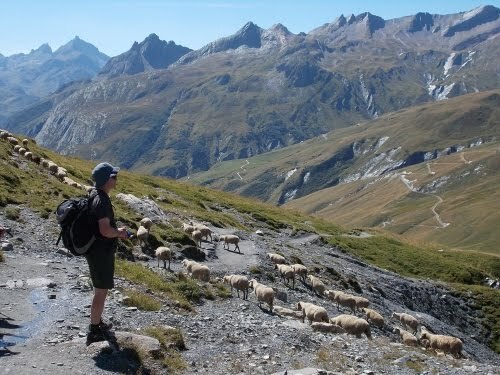 Another hikers admires the endless line of sheep. 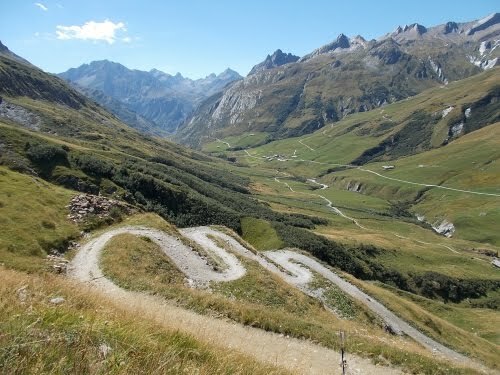 Col de la Seigne, and the French-Italian border. That transparent box in the background has supplies for the ultra run. 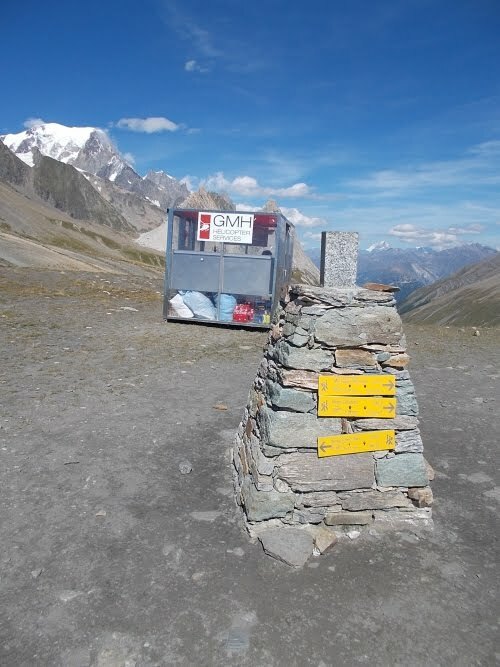 A giant cairn also marking the French-Italian border. 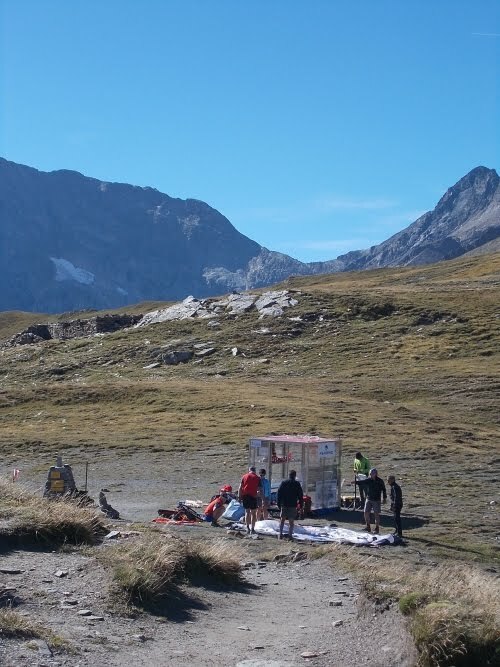 By the time I left, a team of people had started work in setting up this aid station for the ultra run. A good hint, I thought, that the runners would likely be running through during the night. Former custom house. Notice the sedimentary mountains behind it on the right side of the valley. All that is part of the African plate. 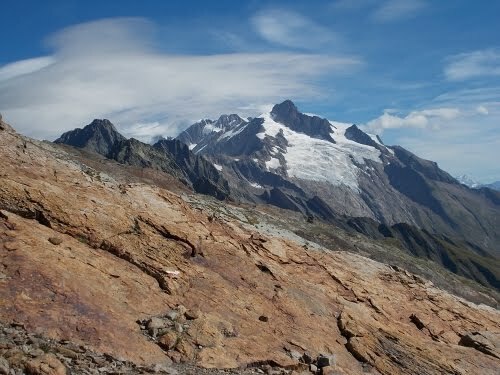 Compare that to the right side of the valley which is primary granite and the mountains are much taller and covered with snow and glaciers. This side is part of the European plate. 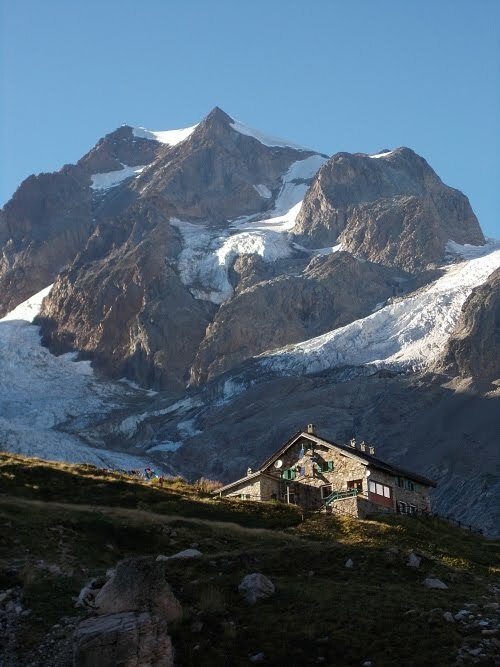 Refuge Elisabetta. I'd set up camp a little below it next to a small waterfall.